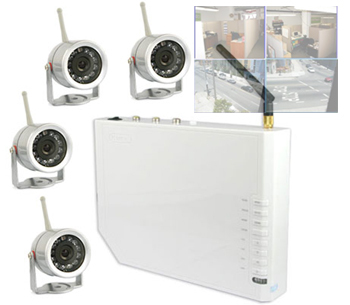 This wireless camera kit includes 4 fully weather proof outdoor cameras with built in microphones and infrared night vision L.E.D's, the 4 channel quad receiver allows you to view each of your 4 cameras in turn or select which camera to view or see all four cameras in the split screen mode all at the press of a button, the receiver has a video out socket, allowing video and audio can be watched/recorded using a standard TV, LCD display, VCR, camcorder etc. This camera kit makes an ideal surveillance device for many situations. Min linear range 100M without blocks.